Consider for a moment, the handles on your kitchen cabinets. It’s not something you likely think about very much, unless you’re cleaning the cabinets at the time. Then, they become cumbersome. They’re a magnet for food particles, an invitation for little ones to bump their heads on, and a pain to clean. The good news is, Handleless kitchen cabinets are becoming more popular every day. Not only does doing away with handles make your kitchen more efficient, it also give it a minimalist, modern style. If you’re considering new kitchen cabinets, here are a few handleless models to explore. Sometimes known of Pinterest for the home, Houzz has several kitchen themes that use the handleless kitchen cabinets. A really splashy one is the Bohemian apartment kitchen with a fabric back drop. The back drop is enough to talk about, very surprising and eye-catching in an otherwise sleek and monotone room. But the cabinets, with no handles to speak of, really enhance the colour. They’re a subtle gray shade that is easy to keep clean. Another eye catching handleless kitchen on this site is the Tilden Street. This is textbook minimalist, with just a few hints of accessories. There is no colour in the design but white, which really brings in the natural lighting. If you’ve got a kitchen without a lot of windows, this is a good design to look at, because all the white really magnifies whatever lighting you’ve got to work with. And of course, with the handleless cabinets, it’s a very modern look. If you love the minimalist look, but still want a little more of a rustic, fun look, try Apartment therapy. They pair the handleless kitchen cabinets with a worn looking wood to give it a softer, more natural feel. The Mamamekko kitchen is a wonderful one if you’re working with a small space. The floor’s got a great tile motif right in the centre, circled by a lovely dark wood that’s continued on the counter tops. Again, though, the cabinets really pull the whole thing together. In a small space kitchen like this, handleless kitchen cabinets are a must. If you’re trying to make your way through here, knowing that you’re not going to get caught on a cabinet doorknob is a relief. Even the fridge is handleless in this kitchen. It’s worth mentioning that there are a significant number of handleless appliances within our range. The Doorbox website is packed with photos sure to take your breath away. They pair handleless kitchen cabinets with a high gloss finish that sparkles. Though, again, they like to pair them with wood counter tops and shelving, which keeps it from being too overpowering, and gives the whole look a more homelike feel. Cleaning will be a breeze with a handle-less kitchen- for starters, there’s no more worrying about bumping into handles or greasy fingerprints on the handles themselves. With a handle-less kitchen, brushing up against the cabinets and drawers will no longer leave you black and blue. To make using handle-less drawers and cabinets safer, you can install a J style metal grip, which makes it easier to grasp the edge of the cabinets and drawers, reduces wear and tear on the edge, and helps maintain the strength of the edge. This money saver will prevent breakage on the weaker edges of these units, increasing durability and leaving the drawers and cabinets looking smooth for years to come. Leicht designs beautiful handle-less kitchens, ranging from simple to eclectic designs to meet the needs of the customer. If you are seeking an open floor plan for your dream kitchen, you may consider choosing the PUR-FS TOPOS design, creating an inviting area for guests to enjoy a home-cooked meal. 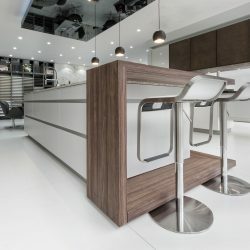 However, if your style is more eclectic, you may also consider the SYNTHIA-C CERES-C collection from Leicht; the masterful technique of combining colours and materials catches the eye, and its chic design blends together to create the perfect kitchen. Looking for a more traditional feeling for your family? Look no further than Leicht’s CHIARA-BG-C LUNA-C collection, with a design eliminates the jarring edges to create a smooth finish, with soft colours to induce a sense of tranquillity. Leicht has many dealers throughout Europe (including Silke Kitchens) for you to visit and search for your perfect kitchen design. Anything that can help a kitchen be more compact and easier to keep clean is a good idea. Handleless kitchen cabinets will absolutely do both of those things.